This is a guest post by Alessondra Springmann. The original article can be found here. 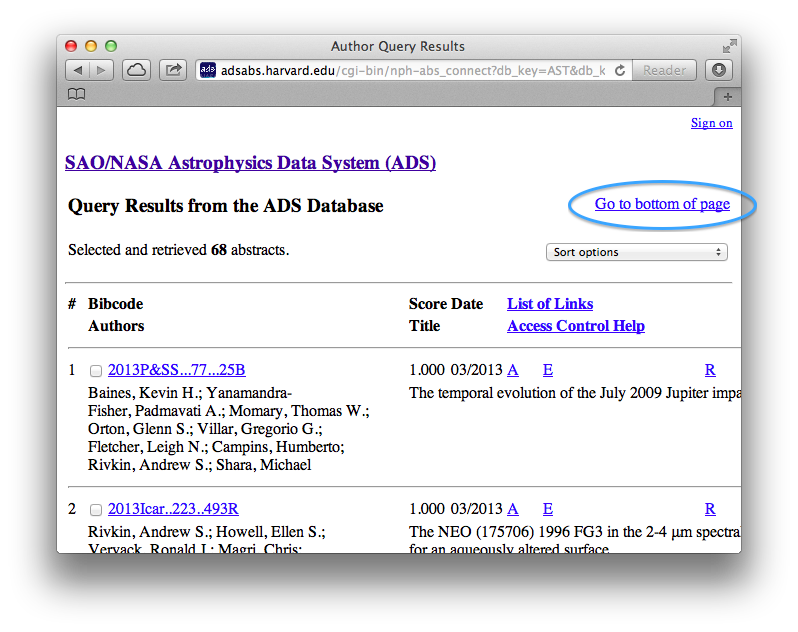 The astronomy and planetary science communities have a fantastic tool for finding scientific papers previously published: the Astrophysics Data System, or ADS, supported by NASA and run out of the Harvard-Smithsonian Center for Astrophysics. The main feature I use is the abstract service, delivering summaries of papers and more. The National Science Foundation requires that you include on some proposals the names of all of your coauthors from the last several years, as well as their institutions. If you have more than a handful of coauthors, or are on publications with legions of coauthors, this task becomes difficult, and quickly! Fortunately, as Leo Stein pointed out, ADS makes this process easy and even pleasant. First, start an abstract search in ADS. I’ll look up my fairy god-astronomer‘s coauthors, because they’re bound to be good folks. 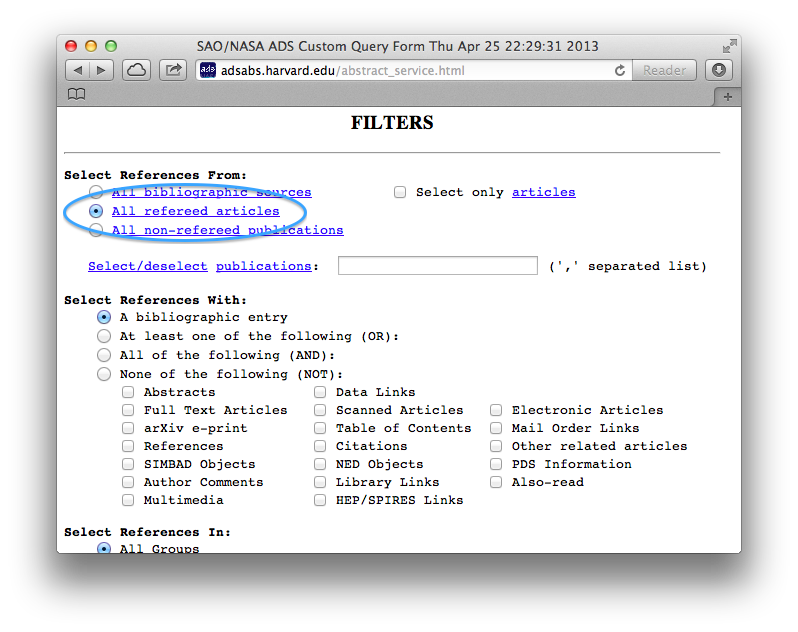 Under Filters we’ll select only refereed articles, because we don’t want every last DPS and LPSC abstract. We have a list of 68 abstracts! Let’s go to the bottom of the page. 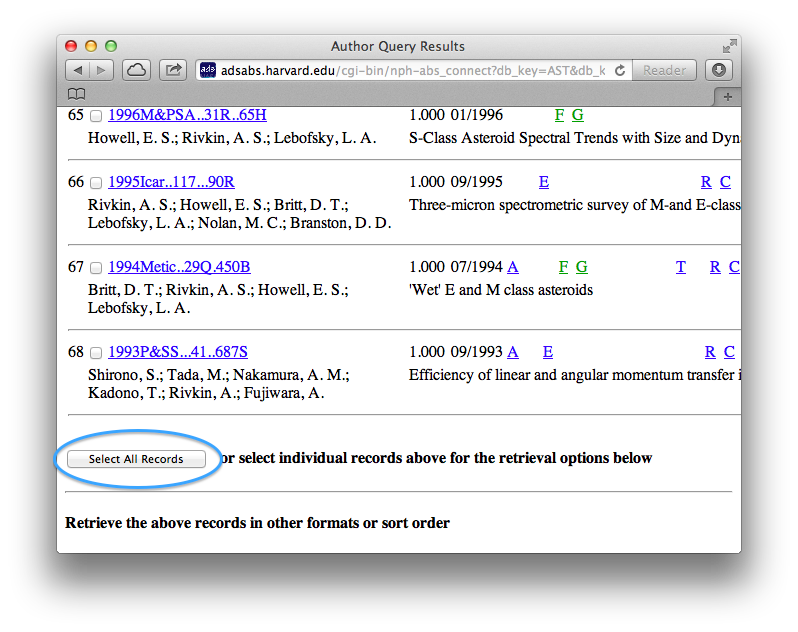 After the final abstract, we can select all records, or choose individual records for which to look up coauthor information. 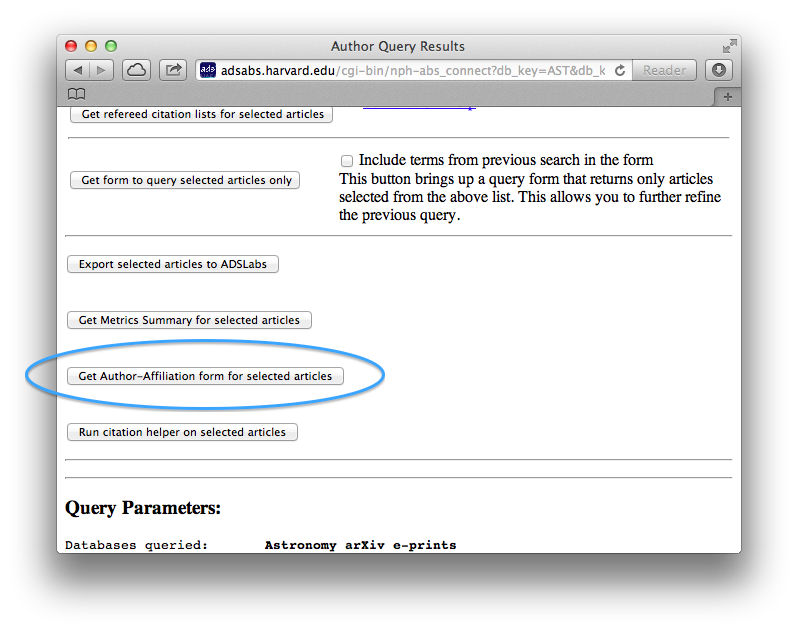 Further down on the retrieved articles page, there’s an option to “Get Author-Affiliation form for selected articles”. 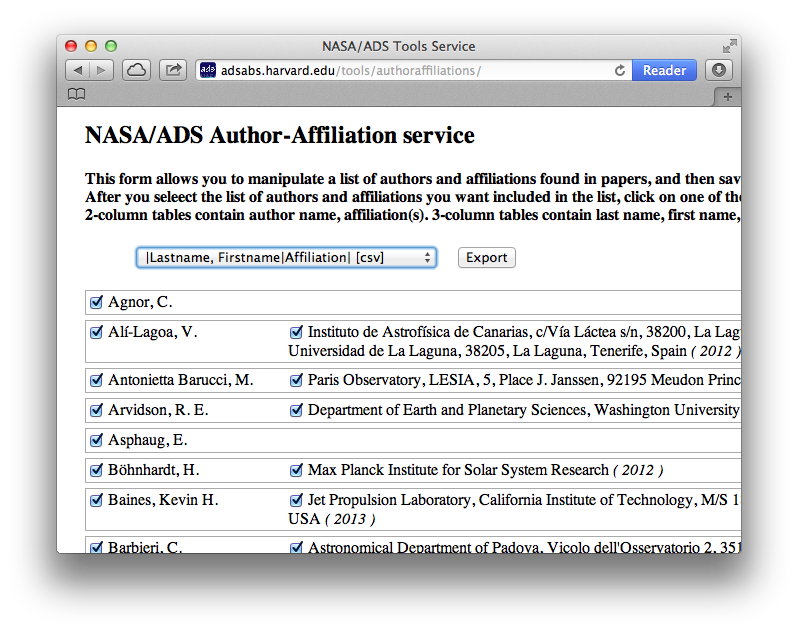 On the Author-Affiliation service page, you can select specific coauthors, and choose their current institution or affiliation, then finally export the whole kit and caboodle to a comma-separated text file (CSV), an Excel file (.xls), text, or to your browser. Submit your NSF proposal, smile, then spend the time you saved to do some actual science. 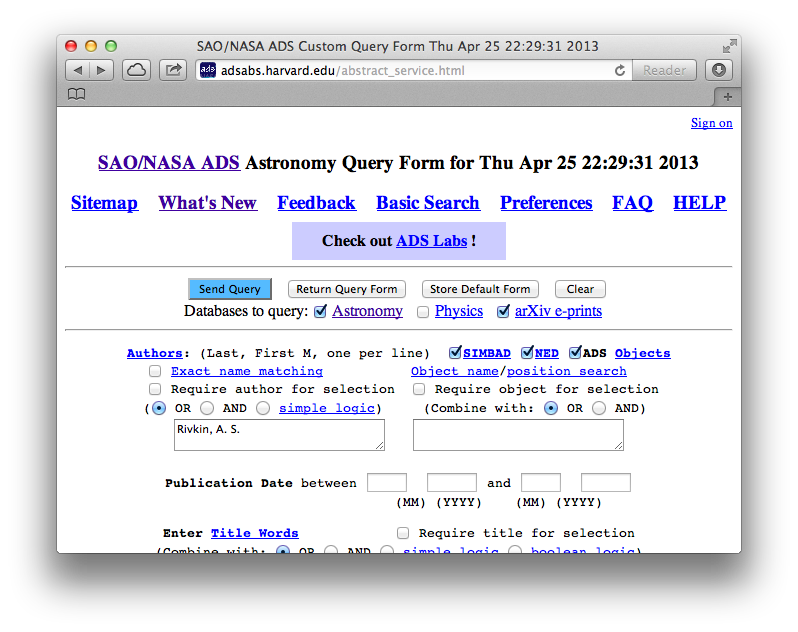 I was first introduced to ADS in 2006 by Chi “Teddy” C. Cheung, and it’s been an indispensable companion since as I try to dig my way through a mountain of astronomical literature. Export all of the references you want to BibTeX or Endnote format? Keep a library of papers? Find out if your friends have been publishing lately? Massage your toes? ADS does all of that, and more. I am tremendously grateful for the grants that enable ADS to continue running and providing these services to our communities. What is your favorite ADS trick or feature? Let’s hear it in the comments! This is an incredibly useful post, and the next time I’m putting together an NSF proposal (soon, actually) I will use this to list my collaborators—thank you! There’s only one very slight caveat, and that is that the NSF wants to know the current affiliations are of collaborators, not what they were at the time they last coauthored a paper with you. (Who know why….) But that should be a pretty easy thing to tweak by hand. Once ADS releases their API, I bet you could quickly cook up a script for determining current affiliations of co-authors and weeding out duplicates. Maybe this’ll happen at the next AAS hack day/hackathon? Next post: What was your REU experience?